Put the tomatoes in a blender and process until the texture resembles a chunky sauce. Put the tomatoes, onion, cilantro, cumin, cayenne pepper, and salt in a large skillet. Bring to a simmer and cook for 7 minutes over medium-low heat. Add the sweet pepper, cover, and simmer for 5 to 7 minutes. Add a bit of water if pan becomes dry. Meanwhile, combine the tofu, turmeric, tamari in a medium bowl and mash with a potato masher or large fork until the tofu resembles the color and texture of cooked scrambled eggs. In a nonstick skillet, cook the tofu mixture for 5 to 7 minutes, or until heated through, stirring frequently. Add a bit of water if pan becomes dry while you are cooking the tofu. For a gluten-free option, use gluten-free tortillas instead of whole-grain ones. Combine the water and millet in a 2-quart saucepan with a tight-fitting lid. Bring to a boil over high heat. Reduce the heat to medium-low, cover the pan, and cook the millet until tender, about 20 minutes. While the millet cooks, sauté the onion in a small skillet over medium-high heat until it turns translucent and starts to brown, about 5 minutes. Add water 1 or 2 tablespoons at a time to keep the onion from sticking to the pan. Add the garlic, sun-dried tomatoes, tamari, sage, fennel, and red pepper flakes, and sauté for another minute to toast the seasonings. Remove the skillet from the heat. Add the nutritional yeast and cooked millet, season with sea salt to taste, and mix well. Using a 1/4-cup measure or small ice cream scoop, shape the millet mixture into patties and place them on a nonstick baking sheet or a regular baking sheet lined with parchment paper. Bake for 15 minutes, turn over the patties, and continue to bake until the patties are firm to the touch and lightly browned, another 10 minutes or so. Will be added to casserole. Combine the silken tofu, chickpea flour, nutritional yeast, sea salt, black pepper, and nutmeg in a blender, and puree until smooth and creamy. In a large skillet, sauté the onion, bell pepper, and mushrooms over medium heat until the onion turns translucent and starts to brown, about 8 minutes. Add water 1 or 2 tablespoons at a time to keep the vegetables from sticking. Add the garlic and sauté for another minute. Remove the skillet from the heat. Add the pureed tofu mixture, crumbled breakfast patties, and spinach and mix well. Pour the mixture into a nonstick 9×13-inch baking dish. Season the potatoes with sea salt and black pepper to taste. Scatter the grated potatoes over the casserole and cover with aluminum foil. Bake for 20 minutes. Remove the foil and continue to bake until the potatoes are browned, 12 to 15 minutes more. Let the casserole sit for 10 minutes before slicing and serving. One could make the patties one day, the casserole the next. For the millet to work as a binder to hold everything together in these patties, you need to almost overcook it. If it seems crumbly when you first make it, add 2 to 3 tablespoons more water to the pan, cover tightly, and let it cook for another 2 to 3 min. The millet should hold together when pinched between your fingers or pressed against the side of the pan. Chickpea flour is a gluten-free flour and is not easily exchanged for flours containing gluten. It’s used in this dish as a thickening agent and, while you can use wheat flours instead, chickpea flour imparts a specific flavor that works especially well in this dish. Add oats to food processor, blend on medium until oats turn into flour. Do not turn it into a powder, you want it slightly course. Add all ingredients into food processor and blend until mixed thoroughly and its batter. Let batter stand at least 10 min so oats can absorb liquid. Note: Do NOT cook pancakes on more than medium heat! These pancakes are dense, and it takes a little while for oats to cook. If your stove top cooks hot, you are better off turning it down a little and being patient. These are NOT 5 min flap jacks and take a while to cook. About 7-8 min per side. Serv! I love to add walnuts (This would make the recipe PS), a sprinkle of cinnamon and pure Michigan maple syrup. NOTE: Do not expect these to be like a fluffy flapjack. If your batter is too thick, they will be gummy in the middle. This recipe can only be made without oil if you have a high quality hard anodized non-stick pan (like Scan Pan brand.) If you are not sure about the temperature setting, start lower than you think. As oatmeal cooks, thoroughly wash the pear and slice pear in half and dice. Leave skin on the pear. Thoroughly wash the blackberries if not frozen. Don’t peal the apples/pears that you enjoy…the skin provides a concentrated source of phytonutrients. 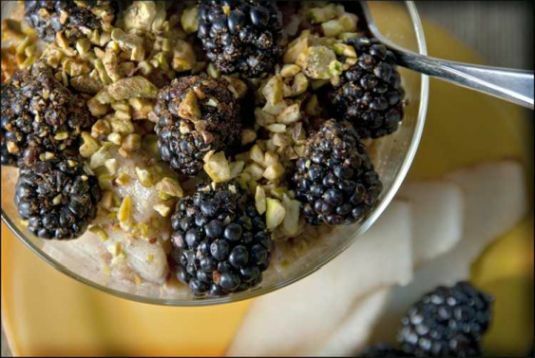 Any fresh or frozen berry can be substituted for the blackberries, including black raspberries, when you can find them. Take a second to admire your beautiful creation. Take a relaxed breath and then enjoy every, single bite. Timaree’s innovative and engaging cookbook, The Foodie Bar Way: One Meal. Lots of options. Everyone's Happy., provides incredible options to make everyone happy. Available as an Ebook or a full-color, 303 page, printed book, at www.FoodieBars.com. Preheat oven to 350 degrees. Line muffin pans with parchment paper liners or have a silicone muffin pan available. In a large mixing bowl, stir together all ingredients until just combined. Divide batter evenly into muffin cups, and bake about 25 minutes, or until tops are almost golden and feel just about firm to the touch. Remove muffins from the oven, and place on cooling racks. In a high-powered blender (e.g. Vitamix or Blendtec), combine all ingredients, including the soaking water for the dates/cashews, and blend until silky smooth. Add extra water, a T or so at a time, (up to 5 T total), to achieve the right consistency, (a semi-thick sauce rather than a stiff dip). 1 small to large pineapple sliced into “chip size” pieces, just thick enough to hold the toppings. Almonds, pecans, walnuts, hazelnuts are my favorites! Brush with a little almond or soy milk. Dust with cinnamon and coconut/date sugar. Bake for 5 minutes, just until crispy-don’t let them burn. Wash apple thoroughly and core. Once chips/pizza crust are made top with your choice of fruits and nuts. ~OR~ create a bar and let guests construct their own. Serve immediately. Your guests will love this colorful, healthy and delicious indulgence! 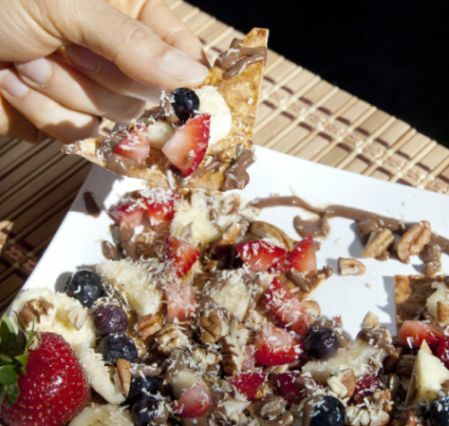 A fun way to share this yummy sauce with your family and friends, while celebrating some of the incredible summer fruits at local Farmers’ Market, is to set up a Dessert Nacho Foodie Bar! Let your imagination run wild when you select whole plant based delectable toppings. Store in a squeeze bottle, at the back of the refrigerator. If you don’t have a squeeze bottle, pour some of the sauce into a sandwich sized zip-top bag, removing as much air as possible before sealing. Then, just cut the very tip of one of the lower corners off (don’t make the hole too big) and use that as a disposable pastry bag! Timaree Hagenburger, MPH, RD, EP-c, cherishes opportunities to connect her knowledge and passion for food, cooking, physical activity & good health with those who follow her. Her style is marked by a blend of fun and practicality, as she offers strategies and inspiration for finding pleasure in preparing and partaking in nourishing meals. Relish in Timaree’s love for whole plant based nutrition on TheNutritionProfessor.com! Timaree’s innovative and engaging cookbook, The Foodie Bar Way: One Meal. Lots of options. Everyone’s Happy; provides incredible options to delight everyone. Available as a Ebook or a full-color, 303 page, printed book, at www.FoodieBars.com. Add oat to food processor, blend on medium until oats turn into oat flour. 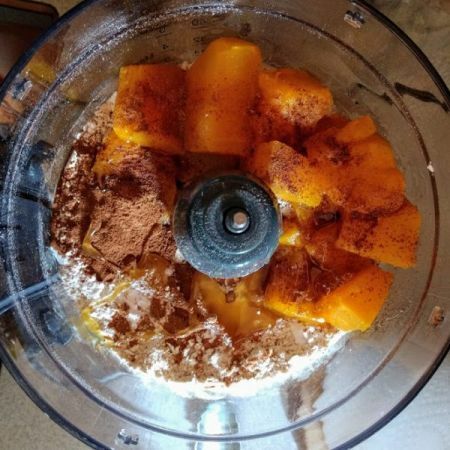 Add all ingredients into food processor and blend until mixed thoroughly and is a batter. Let batter stand at least 10 min in order for oats to absorb liquids. Using a good non-stick pan – turn on medium heat. If you have a good pan no oil is necessary. Esselstyne says if needed, you can use cooking spray and wipe out the excess. Use ¼ scoop per pancake. Do not cook pancakes on more than medium heat! 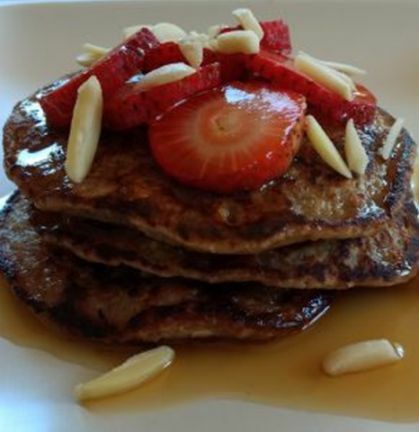 These pancakes are dense and it takes a little while for the oats to cook. If your stove top cooks hot, you are better off turning it down a little and being patient. Toss all ingredients, except parsley, together in the pan. Add ¼ c water to prevent sticking. Roast uncovered for 20 minutes. Stir gently, and add another splash or two of water, if vegetables begin to look like they are becoming too dry. Continue to roast for another 15 min, or until all of the vegetables are tender. VICKI BRETT-GACH is a Certified Vegan Lifestyle Coach and Educator. Connect with Ann Arbor Vegan Kitchen on Facebook (https://www.facebook.com/AnnArborVeganKitchen) and follow her Ann Arbor Vegan Kitchen blog at https://annarborvegankitchen.com for new recipes as soon as they are published. Total Time: 25 minutes if you include cooking jam down. Mix chia, oats and milk in a bowl and place in fridge overnight uncovered. Can soak for an hour in the morning. Cut kiwi next morning. Stick on side of jar. Fill chia / oat mix in jar. Put frozen berries in a small pot on the stove over low heat with juice of half a lemon and 1 T of your chosen sweetener. Use a t-T of jam to sweeten and garnish. Preheat oven to 350 degrees. Line muffin pans with parchment paper liners or use a silicone muffin pan. Divide batter evenly into muffin cups and bake about 25 minutes, or until tops are almost golden and feel just about firm to the touch. Remove muffins from the oven and place on cooling racks. Can be warmed up later in the week. Drain beans and place in a high speed blender. Add the rest of the ingredients, putting in the water last. Blend until smooth and foamy. Set aside and preheat your waffle iron. When the griddle is hot, put a generous 1/3 cup of batter onto the center. These waffles take about twice as long to cook (10 minutes at least, but some irons require 13-15) as normal waffles, but they are so crispy, delicious and good for you, that you won’t mind! To keep these oil-free, I use an Oster brand ceramic waffle iron. I have not had luck with non-stick waffle irons without using a thin film of oil. These freeze beautifully. I make a double or triple batch on two waffle irons and have enough for a month. I eat them in both sweet and savory applications and in the place of bread as they are gluten free. Sue Stauffer knows that eating all the wonderful nutrients in these foods helps you lose weight, strengthen your immune system, improve your sleep and energy levels and brings a new glow to your skin. Her motto is, "Food you love that loves you back!" Check out her site Stirthepotgr.com. Line a twelve-c standard muffin pan with paper liners. Put the flax seeds in a high-performance blending appliance and process into fine flour. Stir with a dry whisk to combine. Divide the mixture amon the lined muffin cups. Bake for 24-27 minutes, or until golden and a toothpick inserted in the center of a muffin comes out clean. Put the pan on a wire rack. Carefully remove the muffins from the pan and cool for about 10 minutes longer. Covered tightly and stored in the refrigerator, leftover muffins will keep for about 3 days. Whole Grain Tortilla Wraps of your choice. First, you’ll need to roast your potatoes. Preheat the oven to 400 degrees F and line a sheet pan with parchment paper, so they don’t stick. Spread the chopped potatoes out evenly and season lightly with salt and pepper. Mae sure you’ve chopped your potatoes about ¼” inch each. Bae for 20 minutes until tender and starting to brown. Make sure they are done by checking one with a fork. While the potatoes are cooking, chop our bell peppers into 2” strips. Get all your chickpeas, corn and spices ready. When there is about 1- minutes left cooking for your potatoes, you can start to cook the bell peppers. That way everything should be done the same time. Add your bell peppers to a large pan with the ¼ c water. Turn to medium heat and cook for 5-8 minutes until tender and the water is basically all evaporated. Don’t move on to the next step until all the water has evaporated. Add the chickpeas, corn, salsa, cumin and chipotle chile pepper (if using). Stir well to coat everything. Cook 5-10 minutes until everything is heated through and the sauce has thickened up. While the veggie mixture is cooking, prepare the avocado cumin cream by processing the ingredients either in a food processor or for faster results, I just used a hand immersion blender. Blend until smooth. Add more water if you want it thinner. Add the cooked veggie mixture to your tortillas and drizzle the avocado cream inside and on top for presentation, if desired. Add optional chopped jalapeno for garnish. I loved the jalapeno, but left it off for my hubby and daughter. The avocado cream is only good eaten right away, as it will turn brown. You can wrap extra burritos tightly in foil (minus the avocado cream) and store them in the fridge. Just reheat in a toaster oven or regular oven at 300 degrees F until warmed through. If you are in the mood for a cheesy Mexican burrito, then be sure and add my Easy Vegan Mexican Cheese Sauce to it for total bliss. Follow BRANDI @ http://thevegan8.com/ You’ll find lots of baked goods here, as I’ve been a baker all my life, it’s my passion! Hope you love the recipes! Share remarks on Instagram , tag me @thevegan8 and be sure to use my tag #@thevegan8 or share them on my Facebook page. Place apples on roasting pan, sprinkle cinnamon on flesh. Cut butternut squash lengthwise and remove seeds. Place on roasting pan flesh side down. Bake for 25-35 min, or until you can easily pierce flesh with a fork. Remove skin from butternut squash (use a knife or scoop out with a spoon). Place cooked squash in blender to puree (may need to add a bit of milk or water, I used a splash of almond milk). In a saucepan combine all ingredients and cook for about 5-10 min or until heated through. I topped mine off with a splash of coconut milk. Cook quinoa in bulk ahead of time so it's ready to use for a dish like this. I prepared the quinoa in this recipe with homemade vegetable stock, no salt was added. Place flour, baking powder, cinnamon and allspice in a large bowl and whisk together. In a separate bowl, whisk together apple sauce, apple juice concentrate, maple syrup and vanilla. Add grated zucchini to the wet mixture and stir until blended. Pour wet ingredients into the dry ingredients. Mix just until dry ingredients are evenly moistened. Stir in walnuts if using. Spoon batter into a non stick loaf pan. Bake on center rack of oven for approximately 50 minutes, or until toothpick inserted into the center comes out clean. Turn bread out onto a cooling rack and let cool completely before slicing or storing. to only use oat flour if gluten intolerant. In another bowl, mash banana with a fork or potato masher. Add all other ingredients (vanilla, maple syrup, apple cider vinegar and almond milk) Whisk together thoroughly. Combine ingredients of both bowls, dry and wet, stir thoroughly. Heat a large non-stick skillet. I use an Ozeri pan and am able to cook until the tops bubble and edges are dry. Turn pancakes over and cook the other side for about 1 minute, until golden brown. Serve immediately with maple syrup drizzled over the top. Wash and shred potatoes using a grater. It’s a good workout! Put the shredded potatoes in a strainer and rinse under the tap, mixing the potatoes around as you rinse them. Squeeze out the excess water – I push with both hands while the strainer is in the sink to drain out excess water. Add any spices to the shredded potatoes and mix. Turn on your griddle, portable grill, waffle iron, panini or 5 in 1 grill on the highest heat setting. Meanwhile, chop up your veggies (I used onions, green/red pepper) and fry in a non-stick pan with a little water or veggie broth. I like to dry fry my onions first before adding the other veggies and water, in order to bring out the natural sugars of the onions. If the water disappears over time, add a bit more water to the pan. You might want to add mushrooms or whatever other veggies you like. When the veggies get close to being soft, toss in some spinach if you like and cook for a minute or two until the spinach shrinks down in size. When the potatoes are done you should be able to lift the lid without anything sticking. Take the potatoes out with a spatula and carefully lay onto a plate. Then add the veggies to one side of the layer. I also add in some fresh chopped tomatoes. Flip the half of the potatoes with no veggies over the half with the veggies to cover them . For the filling use whatever veggies you like. For the removable plates use the grill side – the grill is the bumpy side and the griddle has the smooth side (pancakes). Place a large skillet over medium-high heat. Add onion, mushrooms, zucchini, and broccoli. Cover with a lid and dry-sauté for 3 minutes, stirring occasionally. Add the water and rolled oats. Bring the water to a boil and then turn the heat to low. Let simmer for 4 to 6 minutes until the oats reach your desired consistency. Stir the tamari, spices, and lemon into the oatmeal. Serve warm. In a large bowl, mash the three bananas. Add the maple syrup to the mashed bananas and stir to combine. Add the oats and raisins, and stir to combine. Line a round baking pan with parchment paper. Spread half of the banana mixture evenly over the bottom of the lined pan. Spread the strawberry preserves evenly over the oat mixture. Sprinkle the chopped walnuts over the preserves. Spread the remainder of the oat mixture over the preserves/walnuts. Decorate the top of the cake with fresh sliced strawberries. Bake at 375 degrees for 30 minutes, or until a toothpick inserted into the center comes out clean. For an equally delicious cake, ubstitute strawberries for blueberries and strawberry preserves for blueberry preserves. In a large skillet, add onions and sauté for about 5 minutes, or until they begin to brown. Add a bit of water or broth to avoid sticking to the pan. Once the onions start to brown, add the bell peppers and jalapeño and continue to cook for a couple of minutes until they begin to soften, but are still tender-crisp. Stir in potatoes and black beans, and continue to cook until ingredients begin to blend together and are all rich in color. Add the greens and allow the leaves to wilt. Remove from heat. Season to taste with salt, pepper, and hot sauce, if desired. Serve immediately with whole grain toast or warm tortillas. VICKI BRETT-GACH is a Certified Vegan Lifestyle Coach and Educator. Connect with Ann Arbor Vegan Kitchen on Facebook (https://www.facebook.com/AnnArborVeganKitchen) and follow her Ann Arbor Vegan Kitchen blog at http://annarborvegankitchen.com for new recipes as soon as they are published.